The workforce of the 21st century will be the millennials. They will be the dominant workers of the future for most of organizations in the years to come. Attracting those young talents and making sure they go through a seamless hiring and onboarding experience will ensure success in your overall talent acquisition process. Dynamics 365 for Talent is a full-blown talent and HCM management cloud application suite which can help you with all aspects of talent acquisition and core HCM operations management. This post today highlights some of the key aspects of the overall onboarding functionality in Dynamics 365 For Talent and shows how easy it is to use this app to automate everything you need to ensure your new hires go through a seamless onboarding experience. 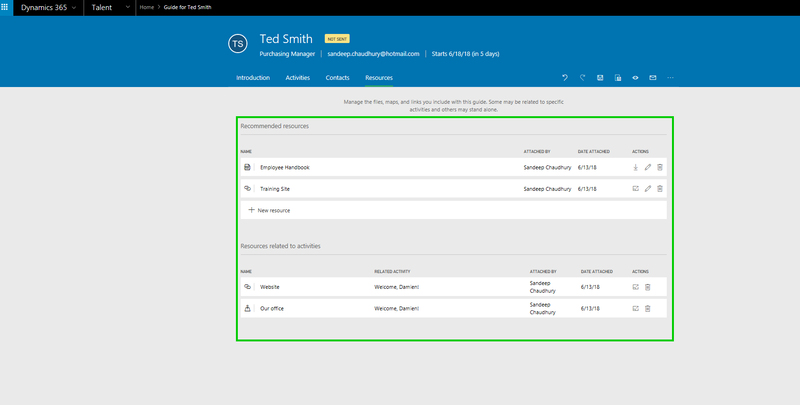 In one of my earlier posts, we discussed a little bit about the ATTRACT experience of Dynamics 365 For Talent and how that integrates with LinkedIn and Office 365. Once your candidates have gone through the interview and job offer process, the ONBOARD app helps you automate the various tasks you need for a successful onboarding. On your landing page of D365 For Talent, you can navigate to Onboard workspace or click the Onboard menu link to launch the Onboard app and you will see the Onboarding guides for all your new hires. You can create new guides from scratch, leverage predefined templates if you have any, or you can even use some sample guides that comes within the app, just like you would use an excel or word template doc to create a new one. In this case, let’s go ahead and create a onboarding guide for Ted Smith, a new hire for the Purchasing Manager position at Contoso. Just enter the name of the new hire, their email ID (Personal email or work email if there is one already setup for them) and select the employment start date. In just a couple of clicks your entire onboarding guide for Ted is now almost ready. Note: The email ID you specify here will be used for communicating with the new hire for their onboarding. In some cases you may create a work account for them already and use that for communication and in some cases you will just use their personal email account, until they are fully onboard and an official work email account has been setup for them. Onboarding Guide Introduction Page: Now you can start making your changes to the Onboarding guide that you copied from the template, or just use of the content from the template itself. You will begin with a warm welcome note for Ted in the Introduction section. Along with plain text, you can include things like URLs, files, maps and you can manage fonts and alignments. Onboarding Guide Activities Page: Next, you will configure the list of tasks/activities the new hire should complete as part of their onboarding with Contoso. This is like their onboarding checklist. You will include things like “Complete a background check”, “review your required training”, learn more about your role etc. You can add YouTube videos, Microsoft Sway presentations, custom apps that you have built using Microsoft PowerApps or even a custom web content (Such as iframe). For each activity, you can assign a Due date, you can provide descriptions and enter persons in your organization that the new hire can reach out to in case of questions. You can also use Sample activities that comes out of the box in the app for ease. Onboarding Guide Contacts Page: You can add a set of contacts that the new hire can contact in case of any questions for any matter during their onboarding process. 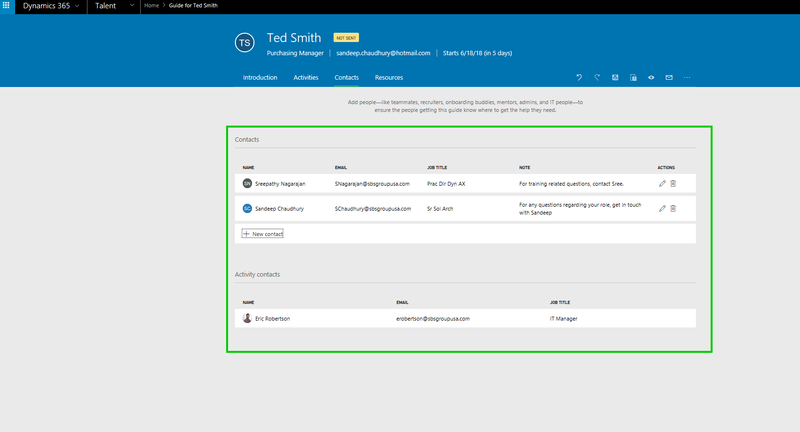 This integrates very tightly out of the box with Office 365 and you can see persons from your organization when selecting and setting up contacts in real time. Onboarding Guide Resource page: In the onboarding guide, you can associate all the resources that a new hire needs for the onboarding. The resources can be a file, image, URL, maps etc. When you are done, you can see preview of the onboarding guide to see how it will look for Ted. 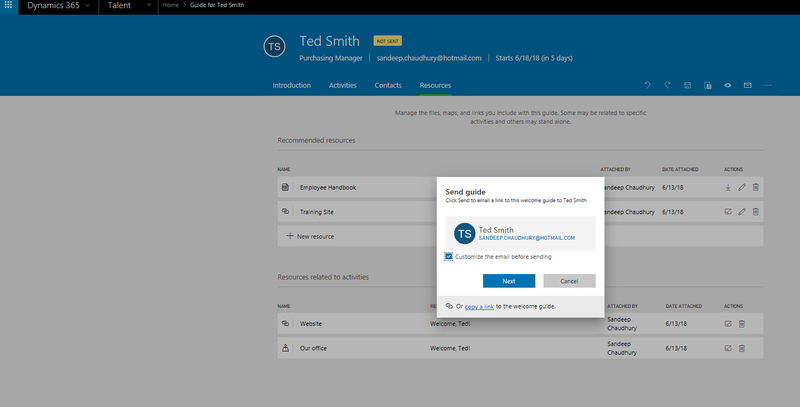 You can then send the onboarding guide to the new hire (Ted in this case) and you can customize the email before sending as well. Lets now see how the overall onboarding experience looks for the new hire Ted. Ted receives the email notification and he can launch the Welcome guide using any device (Laptop, tablet or phone), because it is 2018. Below screenshots shows the sample email notifications and the various screens of the onboarding process for Ted on his phone. Ted can continue and complete everything that he needs to do as per the instructions provided in the onboarding guide. He can then mark the Activities as Completed. As Ted starts to complete the various tasks assigned to him, the HR executives can see the status of Completed activities in real-time. When the Onboarding process and tasks are completed, the onboarding guides can be archived. That was high level overview of how D365 for Talent can help you onboard your new hires ! !